Become a soccer pro all on your own! 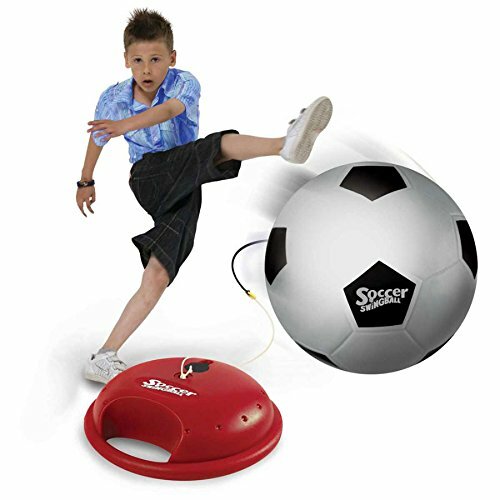 With the Swingball Soccer set, you don't need a whole team to master your soccer skills - All you need is your foot! (Though, some shoes might help, too.) 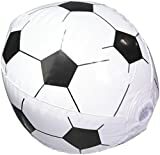 Use the included air pump to fill up the string-attached soccer ball, fill the special base with sand or water for stability, and then twist the crank at the bottom to adjust the bungee string to the perfect length. You're all set for hours of intense soccer action! Give the ball a good, strong kick and - WOOSH! BOING! - The ball comes flying right back. Kick it again - Boing! - Kick it again - Boing! - Kick it again - Boing! - The fun goes on and on! Take turns kicking with a friend. Practice your goal-keeping skills by trying to catch the ball when it comes flying back. Or - Simply work your way up to becoming a true soccer guru. It's the ultimate at-home soccer experience! - It even features a carrying handle for easy transportation. Whether you're at home, in the park, at the beach, or anywhere, soccer skills blast off into master status with the Mookie Swingball Reflex Soccer set. Mookie Swingball Reflex Soccer One-person soccer training set Encourages gross motor skills, coordination, fast reflexes, active play, exercise Soccer is no longer just a multi-player game! Kick the ball and it comes flying right back at you Ball inflates easily with included air-pump Ball connected by bungee string for smooth, fast-paced action Fill base with sand or water for stability Turn crank underneath base to adjust bungee-string length Practice kicking, practice goal-keeping, play alone or with a friend Includes Swingball base, bungee string, soccer ball, air-pump Detailed assembly instructions included Base measures 11 x 11 x 3 inches Bungee string measures up to 55 inches long Designed strong and durable - Play on any surface!